Hello and welcome to the 143rd installment of the SWD. Islamic State launched a counterattack against the SDF in Hisham Abdul Malik district, and allegedly recaptured lost positions, however, several pro-SDF sources reported that IS’ attack in the district was repelled. 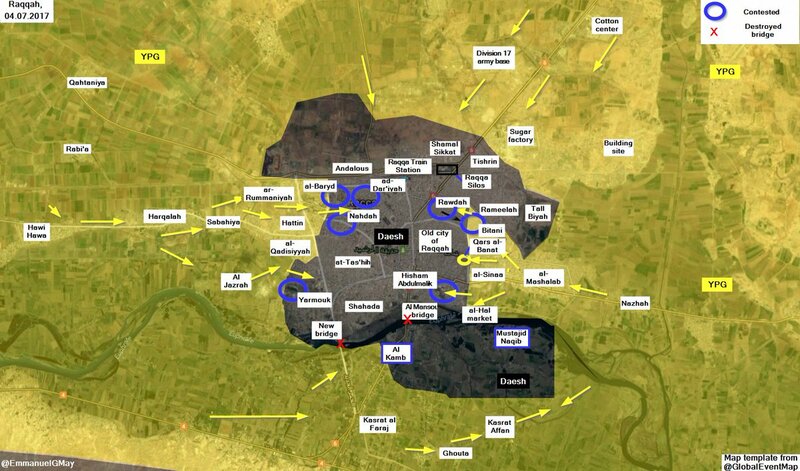 Clashes between IS and SDF continue in Al-Dariyah, Saif al-Dawla and the old city of Raqqa. IS’ SVBIED targeted SDF‘s gathering at the “Baghdad gate” in Raqqa. Hayat Tahrir al-Sham killed one of its fighters, Majid al-Raslan from Abu al-Duhur. Al-Raslan was first kidnapped and then killed by Hayat Tahrir al-Sham’s fighters due to an internal dispute between the fighters. Improvised explosive device exploded on the road between Idlib and Salqin, close to the outskirts of Idlib, without reports about any casualties from the incident. SAA captured three points from the Islamic State, around eight kilometers (five miles) east of Jibab Hamad village. On the front east of Arak, SAA clashed with IS’ fighters in the vicinity of Al-Hail gas field, SAA is reportedly one kilometer (0.62 miles) away from the locality. IS’ Amaq Agency claimed death of five SAA‘s soldiers due to clashes with IS, east of Arak. Faylaq al-Rahman repelled Syrian Arab Army’s attempt to advance on Ain Terma front, one SAA‘s BMP was damaged with an RPG. Syrian Arab Air Force conducted four raids over Ain Terma, in support of SAA‘s operations. Rebel military council of East Ghouta asked the rebel factions to form a unified “Syrian National Army” under one commander. Military council is attempting to stop future rebel infighting by reminding the groups to focus on the common enemy, Syrian Arab Army. It turned out that the prisoner exchange between Jaysh al-Islam and Faylaq al-Rahman reported on Monday, didn’t take place, as the latter failed to show. Abu Ziad, from Jaysh al-Islam, stated that the reason why prisoner exchange didn’t take place is because Faylaq al-Rahman demanded the release of Hayat Tahrir al-Sham’s prisoners too. Syrian government’s National Reconciliation Committee met with local “leaders” of rebel-held Jayrud, in the East Qalamoun pocket. The two sides discussed the possibility of a reconciliation, local leaders accepted some of the demands/requests, such as the reopening of government institutions in the locality, and an option to settle the cases of the interested individuals, giving them an option to return to the normal life. However, pro-rebel sources claimed that the Syrian government is trying to reach a deal/settlement by intimidating local population. The only supply route to Jayrud was allegedly cut and the locals threatened with a military escalation if they don’t accept the terms in 24 hours. Rebels started a new offensive against the IS’ affiliate, Jaysh Khalid ibn al-Walid, the offensive is being called “Fatah al-Futouh”. New operation room was also formed, named “Al-Saff al-Waheed”. The offensive started on several axis, with rebels attacking Adwan, Tel Ishtra, and Jallin. Jaysh Khalid ibn al-Walid’s T-55 tank was destroyed with an anti-tank guided missile, near Adwan. Unknown gunmen assassinated commander in Katibat al-Sunat w al-Jimaea (Battalion of the Sunnah and the Community), part of the Free Syrian Army, Mahmoud Fawaz al-Ghibiti, known as Abu Abdo. The assassination took place in the city of Dael and was allegedly committed by the members of Al-Ghibiti’s group, as internal struggle is ongoing in the battalion. 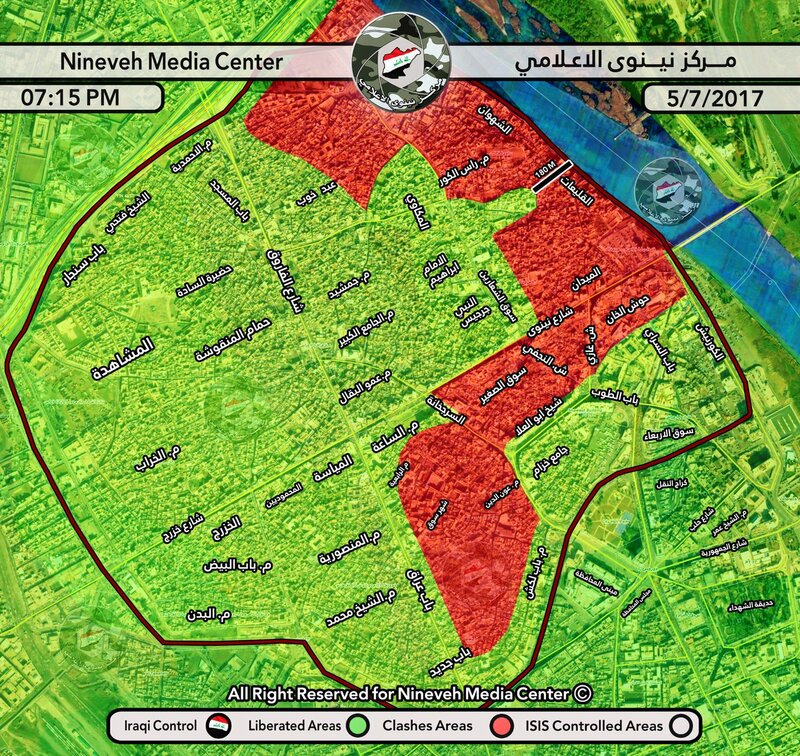 Iraqi forces made limited advances against the Islamic State in several areas of the Old Mosul district. Iraqi Federal Police dismantled 36 IS’ improvised explosive devices during today’s advances. Iraqi forces also freed 24 families used as human shields by IS in the Old Mosul. Islamic State launched an attack against Al-Hashd al-Shaabi (Popular Mobilization Units) in the village of Al-Imam, south of Al-Qayarah. IS’ Amaq released several statements regarding the attack, the first statement claimed death of 11 Al-Hashd al-Shaabi’s fighters and destruction of a Humvee, as IS’ fighters stormed the locality. The second statement claimed death of 10 Al-Hashd al-Shaabi’s fighters, and the third statement claimed destruction of three vehicles and death of six Al-Hashd al-Shaabi’s fighters. Al-Imam village is reportedly under the control of the Islamic State after a successful attack. Islamic State’s fighters raided A-Hashd al-Shaabi-held villages of Al-Houria and Al-Khidraniya, north of Al-Shirqat. Fighting in Al-Khidraniya allegedly resulted in death of six Al-Hashd al-Shaabi’s fighters. On the 4th of July 2017 CJTF-OIR has conducted 33 strikes in Syria. CJTF-OIR‘s main focus in Syria at the moment is Raqqa region where they did 27 strikes supporting SDF‘s operations against IS destroying 17 fighting positions, three tactical vehicles, a vehicle, two heavy machine guns, a mortar system, a weapons cache, a command and control node, a VBIED facility, and a VBIED. Other area where six airstrikes occurred is Deir al-Zour, destroying 11 oil storage tanks, nine oil trucks, six oil stills, six oil separator tanks and a command and control node. Full report on CJTF-OIR strikes conducted in both Syria & Iraq can be found here. Islamic State reportedly assassinated a Major of the Egyptian Army, and a member of the General Intelligence Directorate in the city of Arish. East of Arish, two IS’ improvised explosive devices allegedly killed three Egyptian soldiers and wounded several others.